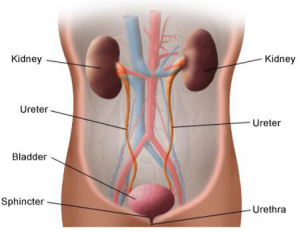 VUR happens when urine that collects in the bladder flows back into the ureters and often into the kidneys. VUR occurs at a frequency of 1 in every 100 individuals. Both the ureters enter the bladder at a diagonal angle and have a special valve system which only permits one way flow of urine. This prevents the urine from back-flowing into the kidney or refluxing into the kidneys (vesicoureteric reflux). What Causes Vesicoureteric Reflux (VUR)? VUR can also happen in children with bladder outlet obstruction i.e. 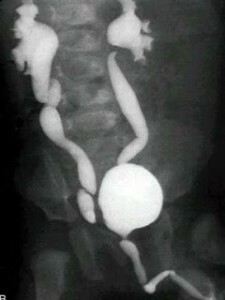 children with spina bifida, posterior urethral valve or other obstructive lesions. Symptoms may vary with the individual. Always consult your doctor regarding the diagnosis. Children with VUR are at risk of recurrent urinary tract infection. 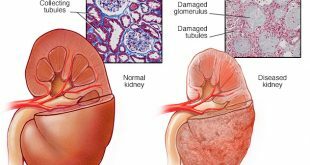 With repeated episodes of infection, the refluxed urine may cause scars in the kidney ad affect the function of the kidney in long-term. VUR is usually diagnosed via a special X-ray named Micturation Cystourethrography or MCUG. MCUG is a special radiology examination. Contrast is used to “colour” the urine so that it appears bright on the X-Ray film. Occasionally, children require sedation before the procedure. A rubber tube or catheter will be inserted into the urinary opening or urethra and the contrast administered. Once the bladder is filled with contrast, the child will be instructed to urinate and films are taken during and after urination. This will capture reflux if present as shown in the picture above. MCUG also helps in grading the severity of VUR; grade I being the mildest form while Grade V the most severe form. If your child has an unexplained fever; the urine should be tested to exclude any urinary tract infection. It is important that the infection is promptly treated with antibiotics. Children with Grade I to III VUR usually do not need any further treatment apart from regular clinic surveillance as the reflux problem usually improves with time. Children with repeated urinary tract infection and VUR Grade III and above may need antibiotic prophylaxis to prevent infection. It is best if you discuss with your attending doctor regarding the management plan. Gargollo, P.C., & Diamond, D.A. (2007). 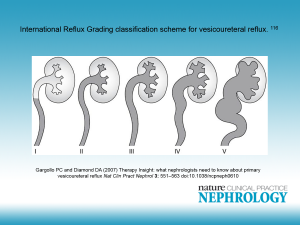 Therapy Insight: What nephrologists need to know about primary vesicoureteral reflux. Nature Clinical Practice Nephrology, 3, 551-563.